Highly energy, the caviar is appreciated for these components: protein, fat, sugar, vitamins (D, C, PP, B2, B6 and B12), minerals and water. Each 100 grams of caviar contains 1400 Kcal. However, 75% of the cholesterol contained in the fat, are of type LCH, beneficial for the health. Size: Large pearly grains, 3 - 3.5mm in diameter. 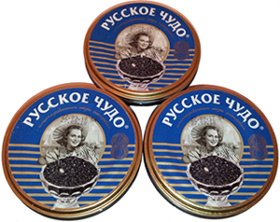 Recommended Portion: 30 to 50 g of caviar per person. All caviar is packed in separate parcels of 3,6,12 or 24 jars for the most convenient and favourable transportation for our consumers. © 2006-2015 Caviar-Market.com. All Rights Reserved.